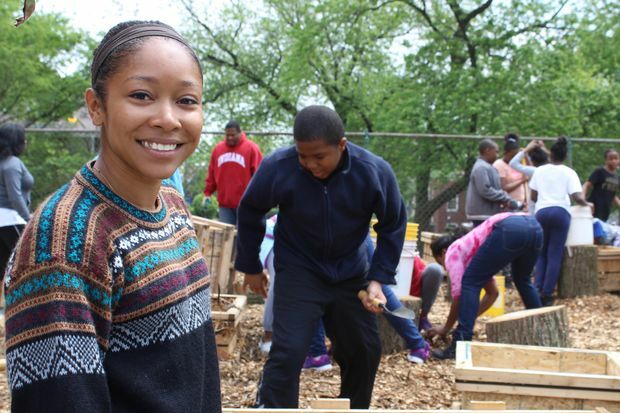 BEVERLY — Dejah Powell returned to John Vanderpoel Humanities Academy Friday to build a community garden alongside students at her elementary school alma mater. 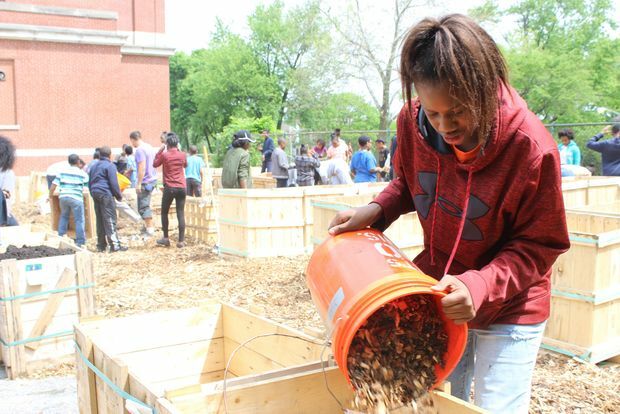 Some 50 students filled planter boxes with wood chips and soil, planted seedlings and created a community gathering place at the school at 9510 S. Prospect Ave. in Beverly. Powell, a Hyde Park resident, secured the funding for the project. She landed several grants to pay for the $8,000 garden on the southeast corner of the campus. 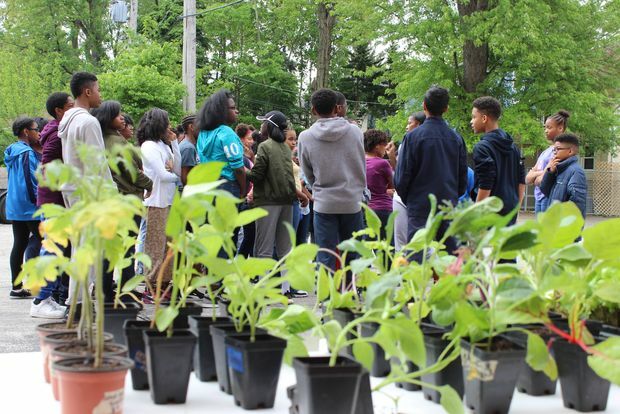 The funding also includes classes to teach students about urban gardening. 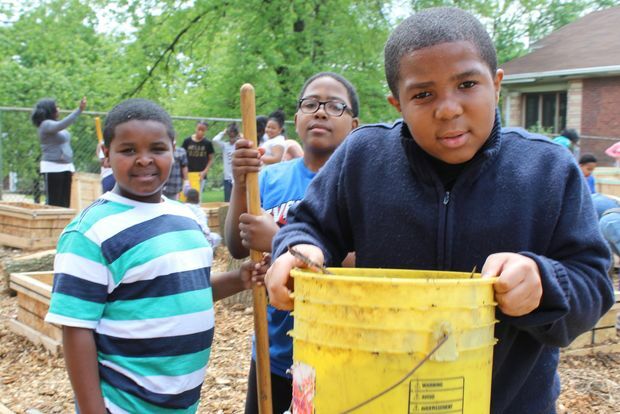 "It's about getting kids outside and educating them on the environment as well as growing their own food," said Powell, who went on to graduate from Whitney Young Magnet High School on the Near West Side. Powell just wrapped up her junior year at Cornell University in Ithaca, N.Y. She is studying environmental and sustainability science with a minor in business. The university pitched in $2,000 for the Vanderpoel project. Principal Kia Banks said the next phase of the project will include building an outdoor classroom on the north end of the school. She also hopes that the garden produces enough vegetables to be sold at a farmer's market as well as some for sampling in the school cafeteria. "Many of our students come from areas that are food desserts," said Banks, noting that some students attending the magnet school may not be familiar with freshly-grown produce. Adam Zmick, the executive director of Gardeneers, was tapped by Powell to take the lead on installing the garden and teaching students various lessons related to Vanderpoel's new green space. Zmick is a co-founder of the group that works with 26 area schools. He said programming will continue throughout the summer as well as next year. Kimberly Donson is an administrator at the school. Her daughter also graduated Vanderpoel with Powell. On Friday, she was quite direct when addressing students as they prepared for a day of working in the soil. "It's time to get dirty. If you are not ready to get dirty, let me know right now," Donson said.